This year marks the 200th anniversary of the publication of Mary Shelley’s groundbreaking novel “Frankenstein; or, The Modern Prometheus” and the campus community is invited to come celebrate in the laboratory — the Visualization Lab in the Price Science Commons and Research Library. Hosted by the UO Libraries and the 19th-Century British Studies Group, the Visualizing Frankenstein Open House is a participating event in Frankenreads, an international celebration organized for Halloween 2018 by the Keats-Shelley Association of America and co-sponsored by the National Endowment for the Humanities. Tuesday, Oct. 30, 10 a.m.-2 p.m. This is a drop-In event; come any time. Please bring a laptop. According to event co-organizer Courtney Floyd, a doctoral candidate in the Department of English and a graduate employee with the science library, Visualizing Frankenstein is an opportunity to do more than just impersonate a mad scientist. During the Oct. 30-31 open house, students and faculty members can drop in the Visualization Lab for a hands-on introduction to using the latest digital scholarship tools. Although it is now two centuries old, Shelley’s novel continues to lend itself to new scholarship and exerts an enduring cultural influence. The inspiration for countless stage plays, movie and television adaptations, comics, toys, popular songs, video games and more, it also continues to rank as one of the most widely read and studied works of literature worldwide. According to the Open Syllabus Project, “Frankenstein” is the most frequently taught literary work in college English courses and the fifth most frequently taught book in college courses across all disciplines. Like the monster at the center of its narrative, “Frankenstein” the book was famously born out of both intellectual foment and chilling circumstances. The author and her paramour and soon-to-be husband, the Romantic poet Percy Bysshe Shelley, were spending the summer of 1816 at a Swiss villa rented by the notorious Lord Byron. Owing to a massive volcanic eruption in the South Pacific, weather across the entire northern hemisphere was unseasonably cold and dreary that year. Forced to abandon the open-air recreations they had planned, the group retreated indoors and found entertainment in intellectual debates and reading aloud from a volume of traditional ghost stories. Byron proposed that they hold a contest to see who could invent the most frightening, original tale. In the end, it wasn’t much of a competition. Byron produced only a fragmentary story inspired by Balkan vampire legends, and Percy Shelley produced nothing at all. But Mary, inspired by “grim terrors” of a particularly vivid “waking dream,” composed the first, short-story-length draft of “Frankenstein." Combining themes drawn from Classical mythology and Enlightenment natural philosophy — the term then used for the physical sciences — with the established form of the Gothic Romance, she had created a uniquely unsettling work. Impressed, her husband-to-be encouraged Mary to expand her narrative into a full-length novel. The story debuted for the public in 1818; its critical reception was initially mixed, but “Frankenstein” achieved almost immediate success with readers. Today, many scholars mark its publication as the genesis of the modern horror and science-fiction genres. 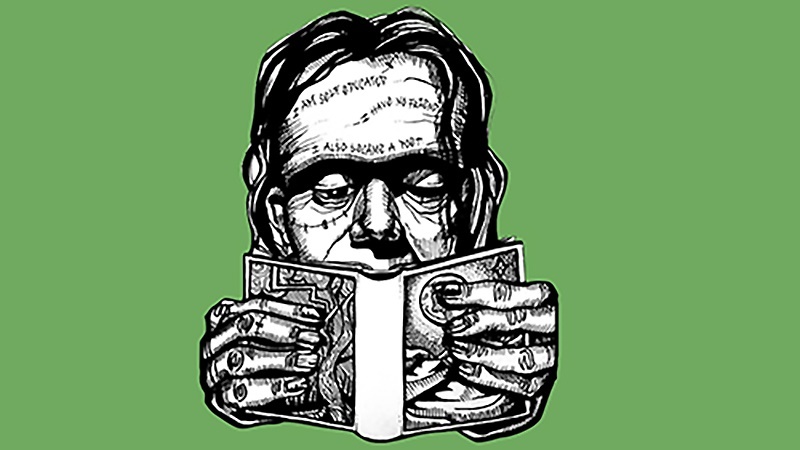 With events planned for Halloween week in more than 40 countries, the scale of Frankenreads 2018 speaks to the book’s enduring influence and global appeal. Members of the UO community who come to the Visualization Lab for Visualizing Frankenstein will be joining a celebration that spans six continents.